97 p., 15,5 x 23 cm. 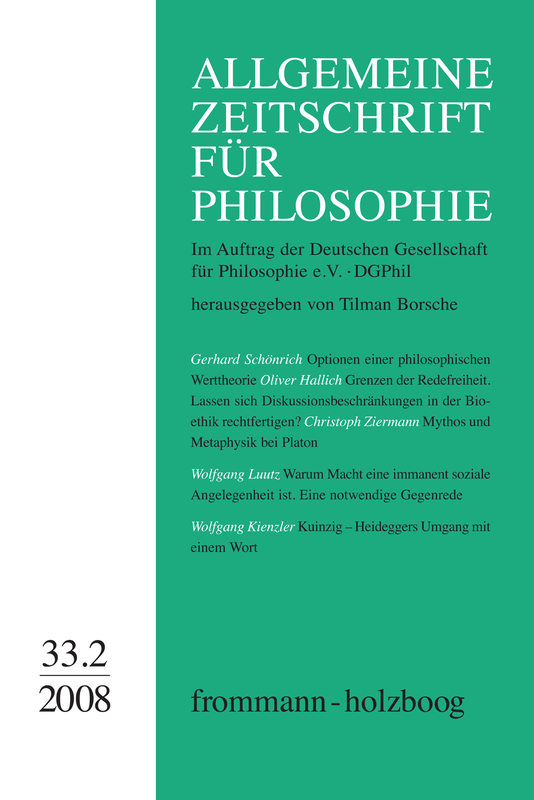 With contributions by Oliver Hallich, Wolfgang Kienzler, Wolfgang Luutz, Gerhard Schönrich and Christoph Ziermann. There is a lacuna in the conceptual basis of the concept of value. This paper develops a contribution to the ongoing debate by presenting the following schema: »x is of value if and only if S has a pro-attitude ψ under conditions C with the content x«, and by discussing several potential conditions which can be inserted into this schema. It is pointed out what kind of consequences go hand in hand with each condition. The resulting proposal is neutral regarding different theories (e.g. emotivist, dispositional, ontological, …), but is able to show how the conditions are to be brought into equilibrium in order to get a plausible definition in the future. Oliver Hallich: Grenzen der Redefreiheit. Lassen sich Diskussionsbeschränkungen in der Bioethik rechtfertigen? In the 1990s, Peter Singer’s views on bioethical topics such as euthanasia or abortion gave rise to a lively discussion of the limits of free speech: Should Singer be granted the right to defend his provocative views in public or can there be good reasons for not allowing a philosopher like Singer to publicly utter his opinions? In this contribution, I pursue this question on a general level as well as with regard to the specific case of Singer. The first part provides a short overview of the bioethical discussion in Germany (1). In what follows I consider a number of possible reasons for restricting the right of free speech with regard to bioethical issues, and I argue that there can in principle be good consequential reasons for not letting a speaker defend his views in public (2). In the final part, which relates to the specific case of Singer, I examine three possible arguments for not allowing Singer to speak in public, none of which, however, is persuasive (3). In order to give a complete picture of the significance of myth in Plato, the article distinguishes four different levels: Plato’s critique of myths, the presence of mythical contents in the inner order of the logos itself, the mythical elements in Plato’s representation of the relation between the logos and the transcendent, and the myths that Plato introduces in his dialogues. It is demonstrated that on each level, Plato’s attitude towards myth changes in the transformation from his early to his later dialectical metaphysics. But myth not only pervades Plato’s entire philosophy. The article’s main objective is to show that Plato succeeded in freeing his early metaphysics from the mimetic entanglement with myth by means of a new and deepened reflexion on the Hesiodic Theogony. At the same time, Plato could transform the profound historicity of the mythical narrative structure into a philosophical form that left myth behind. This article is a reply to Iorio’s thesis about the »non-social character of power«. Iorio develops his own position in distinction to the famous definition of power given by Weber. It is argued in this paper that Iorio ignores the essential problem of the idea of power – the plurality of human intentions. His definition is based on Weber’s instrumental model of action. It is shown that the elimination of the social roots of power corresponds with a reduced understanding of society. Furthermore Iorio ignores important phenomena of power in complex societies, for example such forms of power titled »structural power« or »power of normalisation«. The article demonstrates the advantages of the relational concept of power for an adequate understanding of modern social techniques of power, using the individual ability to self determination. Wolfgang Kienzler: Kuinzig – Heideggers Umgang mit einem Wort.